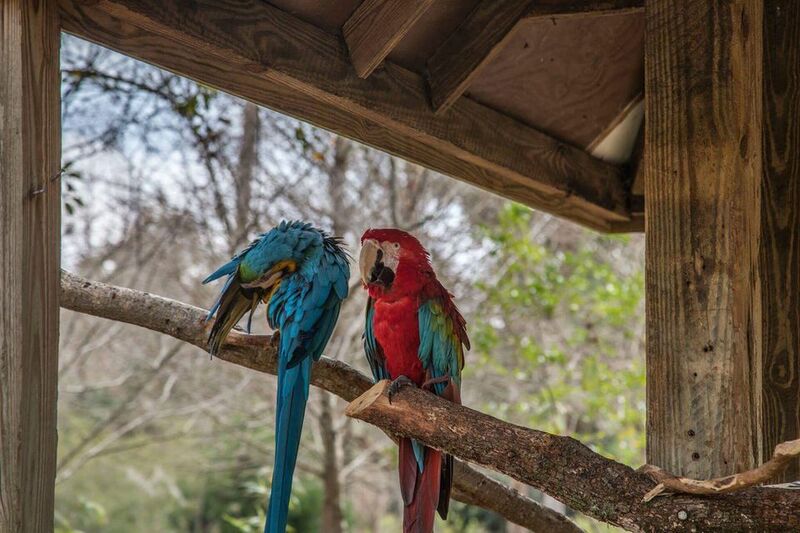 Located on the edge of Lake Monroe in Sanford, Florida, the Central Florida Zoo and Botanical Gardens is family-friendly, interactive, and full of things to see. The Central Florida Zoo and Botanical Gardens was merely a hodgepodge of animals when it first officially opened up as the Sanford Municipal Zoo back in 1925. It was located right outside of the county jail, and the local police officers cared for the animals and maintained the property. The Sanford community would donate food for the animals, and the city supported the zoo financially. It was a city-wide effort to keep the zoo running, and it’s due largely in part to the city’s hard work in those early days that it still exists today. It wasn’t until 1975 that it moved to its current location and a rapid expansion took place. Since then, the zoo has welcomed the addition of hundreds of new animals and exhibits. It's not that biggest of zoos, but it holds a lot of attractions on its 116-acre property. As soon as you enter through the gates of the zoo, you're welcomed by a family of singing Toucans and Macaws (just two of the more than 15 types of birds in the zoo). From there, you'll find plenty to see and do. If you’re heading there with little kids, make sure to check out the Barnyard Buddies Children’s Zoo. Little kids will love to feed and pet the goats and sheep (feeding costs $1). They'll also find llamas, alpacas, and roosters. On super hot days, you can cool off at the Wharton-Smith Tropical Splash Ground, which is located inside the park and included in the admission price. The splash pad is open to all guests, though it is mainly meant to entertain smaller children, but in the Florida heat, it is much needed relief for anyone. The zoo also has a few non-animal rides. A train and carousel, which are ideal for younger guests, and an open-air ropes course, perfect for older kids and adults. Both are an additional fee, and the ropes course requires a reservation as well. The zoo also offers some extra attractions on Saturdays and Sundays. The Walk on Water Balls ride puts visitors into a large plastic bubble, and they must balance over a pool of water. Kid’s bungee jumping is also set up on weekends. Another unique attraction at the Central Florida Zoo is their Keeper for a Day Program that lets you go behind the scenes of the zoo and learn all about what it takes to care for the animals, clean their cages, and prepare their meals. You’ll even get to work one-on-one with an animal trainer to assist in a zoo demonstration. The program is available for a single person or a family. Due to the zoo's smaller size, eating options are limited. Right near the splash pad, there is a large concession stand where guests can purchase all types of fast food—burgers, sandwiches, chicken tenders, and other snacks and ice cream. This stand is open year-round. There is another snack bar at the far-right end of the zoo, adjacent to the KaBoom playground, where you will find lighter fare and a seating area. This snack bar is only open on weekends year-round and weekdays, seasonally. Outside food is not allowed in the zoo, but there is a free picnic seating area right outside of the admission counter where guests are free to eat their home packed lunches and snacks. Grills and alcoholic beverages are not allowed anywhere in or around the zoo. The ZOOfari Outpost gift shop is located right outside of the barnyard petting zoo. Smaller snacks and drinks can be purchased there as well. Bathrooms are located near all the concession areas and scattered throughout the park. The zoo is located at 3755 W. Seminole Blvd. Sanford, Florida 32771. It’s about 25 minutes north of Orlando. From I-4, travel east to Exit 104 (Highway 17-92). Take a left off of exit ramp onto 17-92. The Zoo is 1/8 mile on the right on W. Seminole Blvd. (Highway 17-92). Parking is free, and electric charging stations are available in the zoo parking lot on a first come first serve basis. The zoo is about a half-hour away from Orlando, where you'll find plenty of things to do, but the surrounding area near the zoo has a few other fun activities as well. Blue Spring State Park is about 25 minutes north of Sanford and makes a wonderful day trip. It's a relaxing place for a picnic, and the springs are absolutely breathtaking. Visitors can swim, canoe, kayak, tube, or snorkel in the designated areas. The spring’s water is crystal clear and a cool 73 degrees year-round, which may be cold in the winter months, but is very refreshing in the summer. Enjoy an eco-river tour in DeBary, located about 20 minutes outside of Sanford. St. John’s Eco Tours takes visitors down the St. Johns River on a two-hour tour to experience Florida wildlife. Guests aboard their hybrid electric/gas boat have seen alligators, manatees, eagles, owls, turtles, and all different types of snakes. Downtown Sanford, though small, is also a fun place to stroll around. Their main drag is filled with one-off gift shops and eclectic artisan galleries. One must-stop is Hollerbach’s Art Haus. It’s become somewhat of a staple of downtown Sanford and is one of those places where you are bound to leave with something unique.